The Westin Building Exchange is a major telecommunications hub facility located in downtown Seattle, Washington. The building got its name from the Westin hotel corporate office that made its home there when the building was first completed. 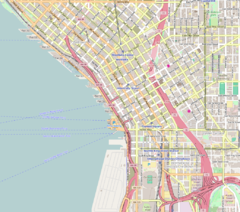 It is also home to the Seattle Internet Exchange (SIX) and Pacific Northwest Gigapop's Pacific Wave Exchange. The facility has a pair of "Meet-me Rooms" on the 34th floor, which are used by telecommunication carriers and internet service providers to cross-connect their individual networks. These carriers situate their POPs within racks spread throughout the building, connecting back to the meet-me room via optical fiber cabling, facilitating interconnection with other carriers' infrastructure within the building. The Westin Building's meet-me room is the heart of the facility, where buyers and sellers of broadband services offer interconnectivity to their backbones and diverse services without the need to utilize telephone company provided interconnections. Tenants in the Westin Building Exchange who sell colocation and cloud services include Apvio, Inc, Colocation Northwest, Green House Data, and Sabey Data Centers. National data center service provider Equinix is located adjacent to the building. ^ "Westin Building". CTBUH Skyscraper Center. ^ "The Westin Building Exchange, Seattle". Carrier Hotels. 2010. Retrieved 2 September 2010. ^ Rawlson King. "Meet-Me Rooms Provide Cheap Carrier Cross-Connects". The Web Host Review.